Palm oil is an edible vegetable oil from the pulp of the fruit of oil palms. It has a naturally red colour due to having a high beta-carotene content. It is 41% saturated fat (by contrast coconut oil is 81% saturated fat). It is semi-solid at room temperature. It does not contain cholesterol (though eating it will still increase a person’s ‘bad’ LDL and ‘good’ HDL cholesterol). Palm oil shouldn’t be confused with palm kernel oil, which is the oil that comes from the seed. Check out the picture above, the red/orange flesh is where palm oil comes from. It is a common cooking ingredient in commercial food (packed food, confectionary, cereals, soups, crackers, chips, pastries, margarines, and so many more) because it is cheap to buy plus it has a high oxidative stability when used for frying (which means it goes rancid less easily), and it has a longer shelf life. It is the second most used edible oil on earth and it is everywhere, just look at the ingredients list on food packaging. It has also risen in popularity due to it being a replacement for trans fats (trans fat is a type of unsaturated fat that behaves like a saturated fat because of its chemical structure. It increases our risk of heart disease by increasing the ‘bad’ LDL cholesterol, while also lowering the ‘good’ HDL cholesterol in our blood). The general view out there is that it is better than partially hydrogenated vegetable oil but more harmful than liquid oils like olive and canola. Many support the view that palm oil is not nutritionally ideal because we don’t want to be replacing trans fats with saturated fats as claims are that since it is high in saturated fat and low in polyunsaturated fat it could still promote heart disease. Palm oil in its raw form has antioxidants, vitamin E and beta-carotene, however once its processed down, fried and inside of packaged foods it has probably (most certainly) been over-cooked and oxidised and therefore it is a definite ‘no-go’ for health. 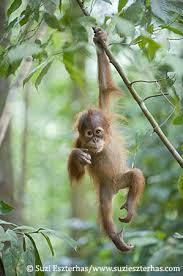 Now back to palm oil and the orangutans. Palm oil plantations are the main driver for deforestation in Indonesia and Malaysia. These two regions account for 85 percent of global production of palm oil. It is often cultivated in an unsustainable way via the establishment of mass palm oil plantations that are harming the environment, indigenous communities and wildlife. Other critically endangered species include the Asian elephant, tiger, Sumatran rhinoceros.